January 22, 2015 – Woodford Reserve is jumping on the Rye whiskey bandwagon with the release of Woodford Reserve Straight Rye next month. The whiskey uses a mashbill with 53% rye grain developed after years of work by Brown-Forman Master Distiller Chris Morris, and will be available in selected US markets. In a telephone interview, Morris described the process that began in 2006. “I’m proud to say we were looking at making Rye whiskey before Rye whiskey was cool again, before its current popularity,” he said. “You could count on one hand how many Rye whiskey brands were out in the marketplace…we thought we were going out on a limb taking a risk in making Rye whiskey, so we didn’t make a whole lot for a number of those early years.” As a result, availability of Woodford Reserve Straight Rye will be limited for the first several years while stocks of aging rye catch up. 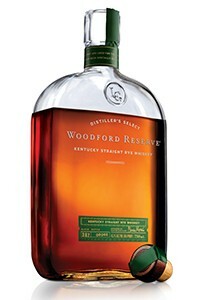 The new whiskey, like all of the Woodford Reserve expressions except for the Master’s Collection releases, uses a blend of whiskies distilled at the Woodford Reserve Distillery in Versailles, Kentucky and the Brown-Forman Distillery in Louisville. The mashbills are identical at both distilleries, but the Versailles facility triple-distills its spirit using three pot stills, while the Louisville facility double-distills with column stills. There is one difference between the two, according to Morris, who said the difficult nature of distilling rye grain required one slight change. “We’re using the same recipe, our unique strain of yeast, extra-long fermentation at both distilleries…it’s still the same sticky substance, we just have to have a little more water in the beer flow in the column still production versus the pot still,” he said. 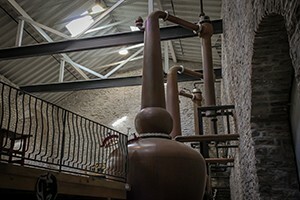 The pot stills in Versailles produce a more robust spirit than the lighter flavors produced by the column stills in Louisville, and blending the two creates a consistent flavor.